and his Kingdom was strong and healthy." King Solomon made really good choices with what he inherited. For the last few months I have been surrounded by amazing leaders who have all sacrificed greatly for the Kingdom of God. Now I have the privilege to glean from their experience, wisdom and enjoy a culture that has taken years to build. Crowned at a young age - with a brief rocky period before he was in power - King Solomon's reign over Israel is viewed as the glory years in their history. He came to the throne with weighty responsibility; not only leading the nation, but also heeding instructions from David (mostly cleaning up messes he made), and building the temple for the Lord. Solomon’s conversation with the Father is astonishing! Here we see a young boy, with an entire Kingdom in his power, coming before the Lord with the desire to lead his people well. What humility and yet striking boldness! Just as a little child cries out to their Father for help, so young King Solomon cried out to the Lord in pure dependence upon Him. The Lord favoured his response and granted him great wisdom, riches and wealth beyond what he could have imagined. 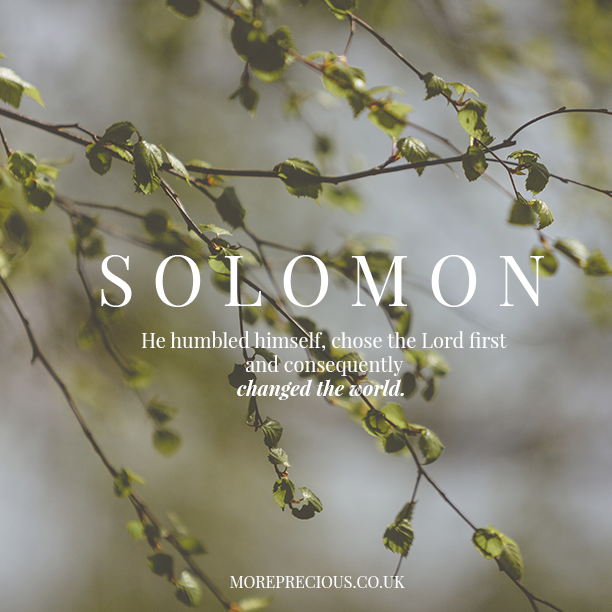 Solomon is a beautiful example of someone who humbled himself, chose the Lord first, and consequently changed the world. He could have asked the Lord for something to meet his needs, but instead asked for something to serve the people. He even chose to build the Temple for the Lord before building his own house! We see a beautiful heart and a desire to serve the Lord FIRST. Solomon stewarded the inheritance he had from his father David - a man who worshipped the Father with raw unashamed praise and captured his heart - with passion and a desire for righteousness. What's more, Solomon's 'strong and healthy Kingdom' drew people to the heart of God. Remember that the Queen of Sheeba came from far away, sceptical of the stories she heard of the wisdom and reign of Israel. Yet, she left giving praise to God because of the things she saw and heard. Solomon could have chosen to live for himself at the beginning, but he chose the Lord. He asked for wisdom, knowing he couldn't lead a nation on his own. There’s so much we can learn from the life of Solomon; both his glory, and his shortcomings. Although Solomon is held up as 'the most wise King', he later turned away from the heart of the Lord and subsequently became a 'fool'. We see it throughout the Bible where the Lord displays his might and miraculous deeds; somehow time and time again, his people forget and choose false Gods. So what can we learn from Solomon? To me it's pretty clear; praise, praise, praise- always have a heart of worship. Stay hungry and never loose your wonder of our incredible God. Its such a joy to partner with the truth and wisdom of our Father; be brave and bold and be those that sprinkle his beauty, wisdom and life wherever we go! Jenny was born in Cheshire, UK, but, with an irresistible wanderlust, has lived all over the world for most of her twenties. Last year she moved from Australia to California to embark on a new journey at ministry school. Jenny is passionate about seeing people encounter the heart of God as well as empowering Christians in business. She's most likely to be found exploring the mountains, having coffee with friends or riding on her motorcycle!